Cage Champs brought back a little of the old school feel on Saturday night. The 56th show for Patrick Smith and company saw some familiar faces return to the cage for a night filled with debuts, KO's, and some evenly matched fights. "It was a good night, very even fights and that's what we go for," Smith said. "As long as they're even and you don't know who is going to win, and I think that's what we saw tonight. It was back and forth and anyone could win." Despite the normal hiccups of fight week, and fighters not showing up for weigh-ins, Smith was able to put together a 9-fight card that featured several "blasts from the past" coming back for another chance to shine in the Cage Championships cage. "It fell together good," Smith said. "It's chaos as normal out here in the sticks. There's times where it's 7 o'clock and I've sat at that table trying to put a fight card together and the fights were supposed to start at 7. If you saw tonight it was old school, a bunch of old school people. I had people come up to me and say, my first fight was here, that's what it was all about. Kevin Green was here, his first and last fight was here. Josh Sampo, it was good to see Lance Benoist here, Matt Ricehouse was here. All these guys, it's old school and that's what it about." In the main event it was St. Charles MMA's Jeremiah Curtright welcoming one of Cage Champs marquee names, Denver Sells, back to the cage after a three-year layoff. Fighting at a 200-pound catch-weight, it didn't take long for the two big boys to get into it. With one big punch, Curtright put Sells on wobbly legs and from there it was pedal to the metal as Curtright never let up on the pressure. A kick to face ended the night for Sells thus passing the torch to Curtright who looked very Jake Collier-esque in his performance. Since returning to action last summer, Curtright looks like a force to be reckoned with. It's hard to think of a better amateur at 185 in the area. Another Cage Champs regular, Colton Carmack, was able to pound out a first round TKO. Carmack had an obvious advantage on the ground and wasted little time getting there. After pulling Stitt into his guard, Carmack took the back, flattened out his opponent and starting punching. Stitt wasn't able to get out from under Carmack. A punch from the top sent Stitt's mouth piece flying across the mat forcing referee Jason Powell to stop the fight and giving Carmack his first win since March of 2015. Evan Whitehead out of Defiance MMA scored a highlight reel KO over Logan Bullock in just under a minute. Whitehead, the brother of another Cage Champs regular Nathan Whitehead, connected with a big punch that sent Bullock flying into the cage for a first round KO. Jimmy D'Angelo picked up the win in his amateur MMA debut. Following on the success of his wife Kelly, the former Cage Champs women's flyweight champ, the seasoned amateur boxer stepped into the cage for the first time on Saturday. D'Angelo had to survive some early danger to get the win when opponent Mike Price dropped him to a knee only seconds after the first bell. Unable to capitalize, it would be Price would go onto the defensive, as D'Angelo started to land his combinations chasing Price around the cage. A big punch flat-lined Price giving D'Angelo the victory and sending the crowd into orbit. Dane Bethel was able to score a second round TKO over Kiowa Wright in a K1 fight that went back and forth several times before Bethel was finally able to get the win. In a surprise, Zack Zerna on a few hours notice was able to KO Clatyon Whaley in the second round, both fighters spent time on the mat in a K1 match, before Zerna was able to put Whaley away for good late in the second. A K1 match-up between Floyd Shahan and Cody Winistoerfer had fans on their feet as the two mixed it up early and often. Shahan's reach seemed to be the difference maker as he made it difficult for WInistoerfer to close the distance and get his offense going. A big, overhand right late in the first round seemed to have Shahan in trouble until he was saved by the bell. Winistoerfer started the second round off with a spinning backfist that connected, and put Shahan on the defensive if only briefly. After landing a combination that started with a kick, Shahan caught Winistoerfer leaning and caught him with a perfectly landed right-footed kick to the head sending Winistoerfer to the mat, ending the fight. Shahan out of the Academy of Courage wins with a second round TKO. Fifty year-old Craig Dalton and fifty-two year-old Bart Nelson were certainly the two oldest fighters on the card, and despite a spirited effort from both fighters, a twisted knee spoiled what could have been a fun affair. Dalton came out looking to box, connecting with his jab. Tae Kwon Do blackbelt Nelson our of Flying Dragons in Rolla seemed to favor the kicks and connected with a few to the solar plexus before twisting his knee forcing a fight stoppage. Dalton wins via TKO. Local pros Dakota Bush and Lucas Clay kicked things off with an exhibition grappling match. Vaghi blue belt Clay scored the only submission of the match. 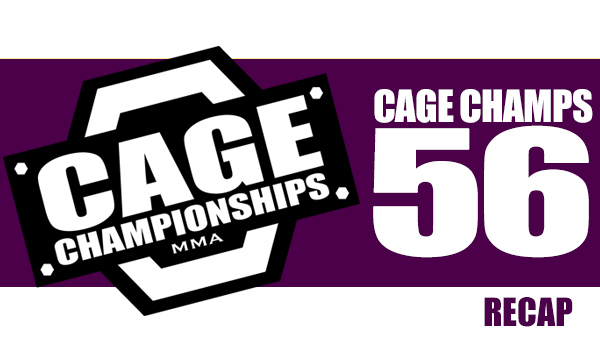 Cage Championships is planning a late summer return.